The presence of Alejandro Jodorowsky on the jury of this Festival of Films of the Fantastic will have seemed to everyone as much a surprise as an honour. This too unprolific director, author of trailblazing films such as Panda and ~ The Sacred Mountain and, above all, El Topo, had in effect withdrawn from the cinema scene after the semi-failure of Tusk. To see him reappear just as Dune, this offspring which he had borne within him for so long without ever having the chance to give birth to it, is starting to appear on the world’s screens, can therefore be greeted as an event, as the affirmation that one of the most original directors of films of the fantastic is still around and wants nothing better than to leave his involuntary exile. An exile that is creative, nonetheless, as he reminds us, enumerating for us the main activities of these last few years. 'I’ve written a novel, "Paradise of the Parrots", published by Flammarion, which got the Grand Prix de l'Humour Noire Supreme Award for Black Humour, and I have just finished a collection of short stories, Research on a Dirt Road, also for Flammarion. 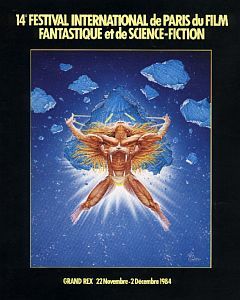 In between times, I’ve been doing scripts for cartoons: four Black lncal albums with Moebius; two with Arnaud (the third is under way) of the Adventures of an Early Riser, and currently, with Carello, I am finishing the second adventure of the Jealous Gods. I’ve also done a lot of work on Tarots, giving lessons and organising courses, and at the moment I am writing a book on the subject for "MA Edition"
How did you develop this passion for Tarots? Have you recently worked on film projects? Doing a sequel to El Topo, that’s primarily a commercial choice? 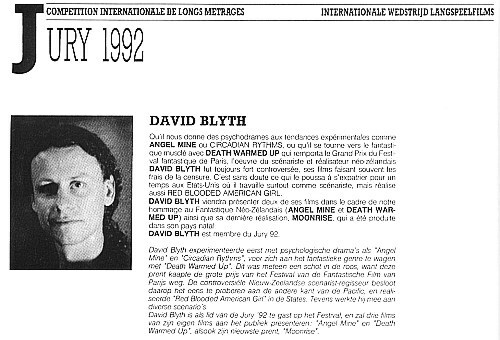 Explain to us the circumstances in which you met David Blyth, the director of Death Warmed Up (Golden Unicorn at the Festival). 'That's a fairly odd affair. I didn’t know him when he called me to ask me to read Tarots for him. I told him to come over and we spent three hours together reading Tarots. At the time he was having very serious emotional problems which were tending to drive him back either to England or to the United States. I consulted the Tarots and advised him to put aside his problems and go back to New Zealand and make films. He listened to the message and left. When he got home he sent me a book to say thankyou. A few years later, I hadn't had any further news of him, I was asked to serve on the jury of the Paris Festival of Films of the Fantastic, and what do you know. He was there, with his film, and it so happened that that was the film I liked best. What interests you about this film? What other films did you particularly like at this festival?